South America 2012: Huaraz - Peru. We all feel a little unreal without Rob, in particular because this was the section of the treking he most wanted to do. The drive from Lima was 8 hours. 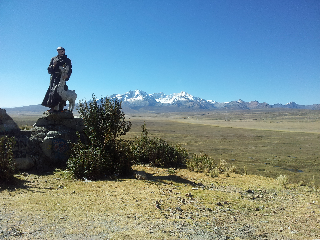 There was some spectacular scenery on the way, and the bus drove over a 4100 mts pass. Huaraz is at 3100 mts. We all seem to feel ok, so probably have not lost too much acclimatization from being in Lima at sea level. This area are situated between the Cordillera Blanca and Cordillera Negra. It's reputation is well deserved as the Himalayas of the Andes. Our hotel room had a beautiful view of spectacular snow capped peaks. We have a free day here today, a day walk to Lake Churrup tomorrow, and then we begin the Huayhuash trek.